As the internet has grown into the sprawling, interconnected web of services it has become today, we’ve seen companies like Google and Amazon dip their toes into the home-service industry. Since we use these services every day, all across the globe, it only makes sense that they’d try to take advantage of the opportunities that the service industry provides. It’s gotten extremely difficult, if not outright impossible, to avoid marketing your business online. Picking one of these services to help your business reach the next level can be a tough decision: how do you know which one would be best for you? 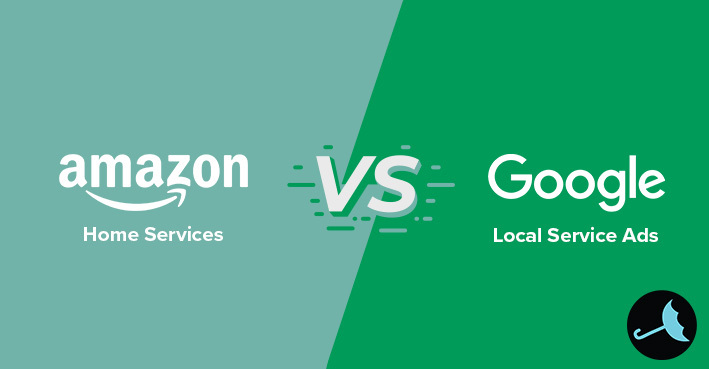 Although Amazon Home Services and Google Local Service Ads aim for the same end result, the route each one takes to get there has some noticeable differences. In 2015, Amazon forayed into the home-service industry by launching Amazon Home Services. This not only gave customers the option to purchase the service of a contractor when they ordered something online, but it allowed them to schedule service directly from the Amazon website. You don’t pay per lead. The way Amazon makes money isn’t through running an ad campaign – instead, they take a cut of the profit whenever a customer schedules a service, anywhere from 15 to 20%. Amazon guarantees the quality of a job. If a customer is unhappy, Amazon’s Happiness Guarantee ensures they will receive a corrected job or a full refund. The price of the service is listed up front. A customer is able to see what the job will cost them without digging around for comparable quotes. Here’s a more in-depth explainer on everything that Amazon Home Services offers. On the other hand, we have the search-engine mega-giant. Google’s home-service strategy is a significant departure from how Amazon goes about it. Google hinges on what’s called the “Google Guaranteed” label. This label, which Google only awards to a business after it’s passed a background check that consists of meeting a list of several criteria, gives prime placement to businesses at the top of search-engine results pages. Unlike Amazon, which only charges commission, Google makes money on their end by charging a company for every lead it generates from this ideal spot at the top of the page. That can range anywhere from as little as $5 to as much as $140 per lead. You don’t get to select the keywords you want to rank for – that’s another Google business’ specialty. Instead, Google picks the keywords that are most relevant based on which categories you select for your business. It then adjusts your placement accordingly. You can pause your business’ ad campaign at any time. When you do, though, you lose your priority placement and instead fall into the regular search-engine results listings. There’s no charge while your campaign is paused, however. It’s impossible to say which one is demonstrably better. Both Amazon and Google each offer unique advantages in their forays into the home-service industry. Each has drawbacks that the other doesn’t. That’s why we can’t just outright say that one is better than the other. It all depends on your business’ situation and specifications. However, VitalStorm prides itself on helping businesses determine what the optimal strategies are. Give us a call at 1-877-311-5695 to see how our unique digital marketing solutions can help your business stand out in a crowded market. From PPC campaigns to fine-tuned social media strategies and everything in-between, we drive leads.